Now that the weather is finally heating up, it’s time to think of ways to cool down your playful pack of kids. 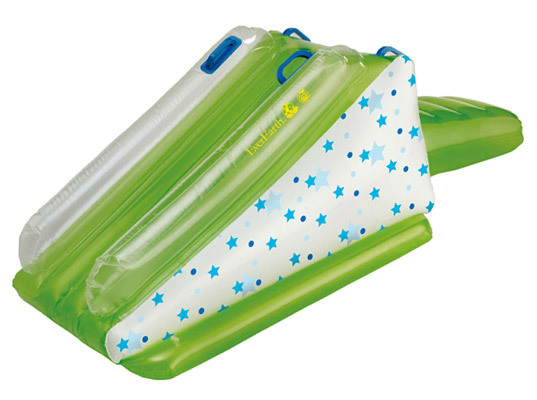 One good green way to splash into summertime fun is with EverEarth’s upcoming range of inflatable pool toys. Made from thermoplastic polyurethane (TPU) rather than toxic polyvinyl chloride (PVC), the colorful floats are free from poisonous phthalates that become air-bound under the intense heat of the sun. Plus, the TPU is biodegradable, unlike its vinyl counterpart, which is difficult to recycle and a landfill mainstay. when & where can we buy this? Now that the weather is finally heating up, it's time to think of ways to cool down your playful pack of kids. One good green way to splash into summertime fun is with EverEarth's upcoming range of inflatable pool toys. Made from thermoplastic polyurethane (TPU) rather than toxic polyvinyl chloride (PVC), the colorful floats are free from poisonous phthalates that become air-bound under the intense heat of the sun. Plus, the TPU is biodegradable, unlike its vinyl counterpart, which is difficult to recycle and a landfill mainstay.